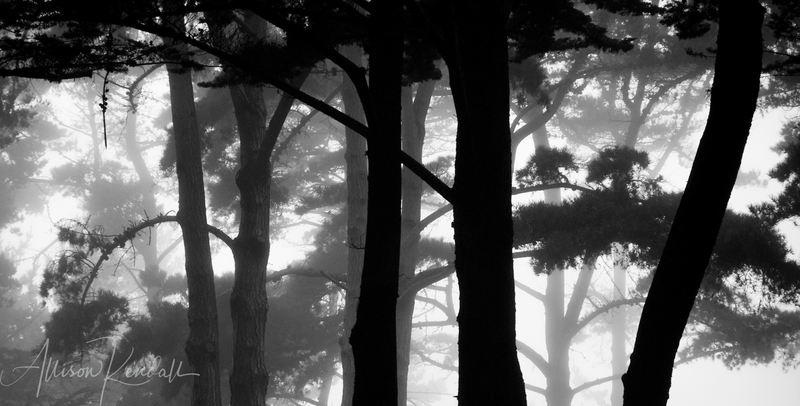 Mysterious, dark, quiet; a grove of trees in the coastal mountains of Big Sur, full of mist and morning light. I’d arrived at the campsite after dark, chasing the sunset down the winding curves of Highway 1 and setting-up camp as stars appeared overhead. During the night, fog gathered along cliffs and settled into valleys, and I woke to find the forest shrouded in soft layers of light. Camping on the California coast is often a damp, chilly affair, and this day was no exception. The warmth of a small fire, the coziness of a sleeping bag and a book, the sound of the nearby ocean all helped to pass the time. As the sun settled again to the west, the early evening light filtered into the deeper, shadowy corners of the forest grove and campground, and I was able to capture this layered scene full of contrasts and soft tonality. The branches of the trees lend a sense of enclosed space; a cathedral of organic shapes and windows of light. Of all of my Big Sur experiences this moment remains one of my favourites, full of the restorative, meditative mood I found present in that particular time and place. This elegant, peaceful scene is available as a fine art print in my Black & White Prints collection. To see more Big Sur Photography, visit my Big Sur, California collection. Awesome picture!!! Reminds me of a morning three and a half years ago: https://docugraphy.wordpress.com/2015/11/10/herbstliches-zwischenspiel-autumn-interlude-bergstrasse/ Best wishes!